More and more often, porcelain stoneware tiles are used for the coverings of contemporary architecture projects, thanks to their physical and mechanical structural properties. For designers and architects, their main attraction is represented, without a doubt, by their aesthetic and plastic qualities. 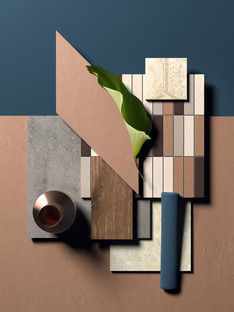 It is not a chance if porcelain stoneware is also called aesthetic high-tech ceramics: indeed, it can offer a variety of colours, formats, textures and special elements, this way contributing to defining the surfaces of indoor and outdoor residential, public or commercial spaces, and to characterising and customising them. The leading brands of Iris Ceramica Group, world leader in the ceramic field, are today offering an unmatchable series of proposals in terms of porcelain stoneware tiles, whose strength and durability performances are well beyond those recognised by the most important certifications in the ceramic field. From an aesthetic point of view, the Iris Ceramica Group products range across all effects and colour solutions thought for contemporary surfaces, from elegant marble varieties to refined wood, classical resins and naturals stones, while also experimenting new contemporary styles for interiors, as it is the case with fabrics. Such a wide offer in terms of colours allows to greatly customise the environments, to use light sources in the best possible way throughout the day, and to combine pieces of furniture of the most different styles, changing them over time according to one’s tastes. Porcelaingres is the Iris Ceramica Group brand that produces top quality porcelain stoneware collections, with brand new application solutions that "become an integral part of furnishings for offices, kitchens, living rooms and bathrooms, as well as for exteriors like ventilated façades or large paved areas”. With its collections, Porcelaingres explored materials and classical, basic colours. 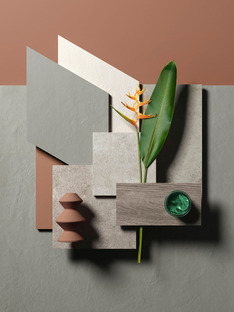 Today, it presents Color Studio, a collection of stoneware porcelain tiles that is markedly based on colours. 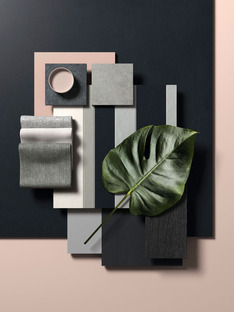 Inspired by natural elements and easily fitting other materials in the range, Color Studio includes eight colours (White, Sage, Night, Powder, Biscuit, Malt, Brown, Cream) with warm and cold nuances. A colour system designed so that warm and cold nuances complement each other perfectly without looking forced, favouring the mixing between colours and their compatibility, without being excessive or eye-catching. 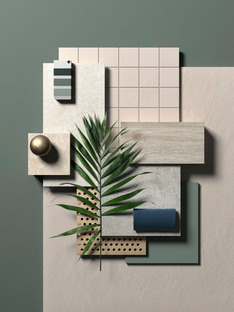 The collection gives a feeling of warmth and relax, further favoured by the combination of eight tiles, where "the textured and matt surface comes to life in the light, with a soft glow that livens the material, making it unique and unconventional”. The Color Studio collection can be interpreted through peculiar shapes and different patterns, and offers traditional formats (120x60, 60x60, 60x30 cm), special pieces such as mosaics and strips and, most importantly, unusual geometrical shapes, such as right-angle triangle, rhombus, trapezoid and lozenge. The Color Studio collection is perfect for those who love basic and natural colours and a sober and relaxing style, that is both intimate and refined. The harmony created by this collection is always hinted at, and never flaunted: it is perfect for those environments where the presence of natural elements, such as water, stones, plants, flowers and, mostly, light, help enhance the details of the slabs.